Mental illness: Wil Wheaton and dealing with depression. 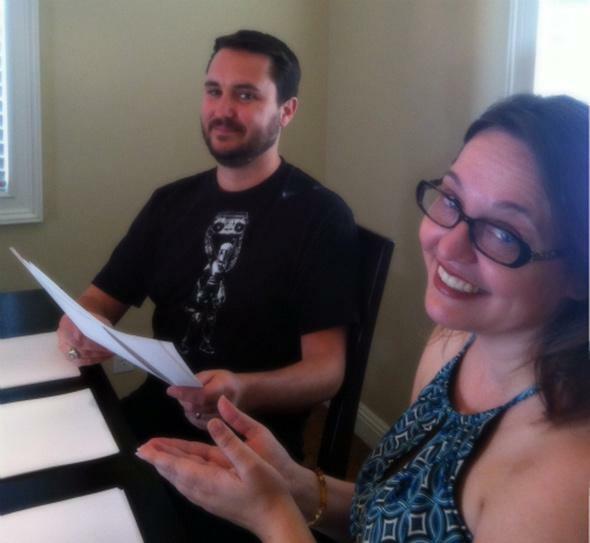 Wil Wheaton, collating papers for Jenny Lawson. Click to explainenate. Wil Wheaton is a dear friend of mine. I have a huge amount of respect for him, for many reasons. He is kind, he is generous, he is honest. I’ve heard countless interviews with him talking about the mistakes he’s made in the past, and how he’s taken more control of his life. He also suffers from a couple of different mental health issues: generalized anxiety disorder and chronic depression. Another reason I love him: He is open and straightforward about this, in a society that stigmatizes these problems. He sat down with the good folks at Project UROK—a mental health nonprofit—to talk about what he’s gone through. You are not the only person in the world who has anxiety. You are not the only person in the world who has depression. You’re not the only person in the world who has thoughts of self-harm. There are people who want to help you. There are people who have spent their entire lives helping people like you and me and all of the people that you’re seeing in this video. And you’re not alone. You are okay. I also recommend the UROK video Mara Wilson did. Her matter-of-fact approach to her anxiety disorder really puts a different face on how you might perceive mental health issues. There’s a decent chance mental illness plays some role in your life, whether it’s you personally or someone you know and love. It’s true for me, it’s true for Wil, it’s true for all of us. One of the most important things we can do is stop treating mental illness like it’s some sort of personality failure, and start seeing it for what it is: an illness. Another wonderful friend of mine, Jenny Lawson, aka The Bloggess, also has mental health problems and is very candid about it. She is also a national treasure. She talks about the problems with depression quite often and, like Wil, is making great strides in removing the stigma behind it. Her book, Let’s Pretend This Never Happened, chronicles her life with mental illness and is both profound and ridiculously (and irreverently) funny. Her new book, Furiously Happy, is a wonder, and will be available soon. I’ll write more about that when it comes out in September. I urge you to read Jenny’s blog (which is decidedly NSFW as far as language goes), and follow her on Twitter. The same for Wil: He’s prolific on Twitter, Tumblr, and his own blog. They’re both on the usual other social media as well. My life is better for having them in it. I hope the same is true for you. And if you have a mental illness, remember, as Jenny says so succinctly: Depression lies. If you can, please, seek help. And also, take a moment to read this entry on Jenny’s blog. Maybe it’ll help, too.